Pace Gallery and Galerie Xippas. The Xippas Gallery is pleased to present James Siena’s first solo exhibition in France. James Siena is a pivotal artist in the New York art scene, particularly known for his creative process based on self-imposed parameters that he terms visual algorithms. By establishing a base unit that he infinitely and obsessively repeats, Siena takes possession of the surface plane in order to focus on complex geometric and abstract forms. 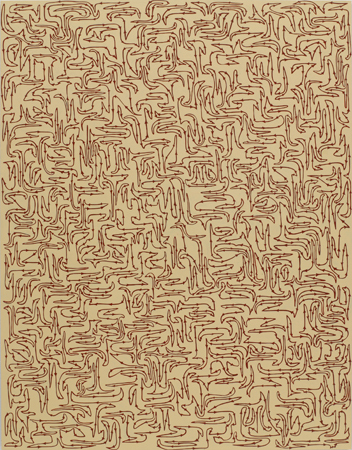 Even though James Siena’s work explores numerous mediums, including lithography, engraves, drawing, and painting, the present exhibition concentrates on a group of eight paintings of enamel on aluminum (a technique that characterizes his work since the 1990s) and thirteen drawings on paper (from 2007 to 2012). The rigorous mathematical process adopted by James Siena and the industrial technique of enamel on aluminum obscures neither the artist’s presence of hand nor the fragility of his lightest touch, which he applies and endlessly repeats. The artwork’s evocative titles Connected Hooks, When I Was Ten (Brown), Liminal Pathway, Earthless or Malevolent Adolescent Form—just to name a few—formulate our position as human beings and conditions the public’s interpretation of these fundamentally non-narrative paintings. Certain patterns resemble interlocking comb teeth, whereas others snake around the space in an unlikely fashion, recalling canal routes, and others even resemble computer formulas or incomprehensible labyrinths. The repetitive elements, sequences, curves, loops, and other delicate labyrinths become the matrix that allows us to see the interstitial space, the passages, and the mutations towards more biomorphic forms. The motion Siena creates, at once rational and poetic, confronts us with an optical riddle that mixes chance and order, where the leitmotiv distinguishes itself in a group that at first glance appeared uniform. All the elements, like human cells, communicate and echo, provoking a particular vibration within the whole. James Siena’s works provoke a feeling of incredible temporality as if they hold in their hearts the marks of ancient civilizations: countless forms bring to mind aboriginal drawings, African textiles, or Maori tattoos. Privileging medium and even small formats, the artist instills an intimate relationship between the painting and the spectator, rejecting the notion that “bigger is better.” Accumulation in his artworks refers more to an expansive development of a pattern drawn from inside of a self-sufficient system, from the core of a closed-circuit network—much like the image of a mental construction. In Siena’s works, the process blurs with the subject, creating fascinating surfaces. The little spaces, similar to fetishes, totems, or icons, concentrate a unique and hypnotic energy that invites the onlooker to choose his own path between the lines and to give himself over to the metaphysical experience. Born in 1957 in Oceanside, California. Lives and works in New York City. James Siena has participated in over 100 solo and group exhibitions since 1981, including the 2004 Whitney Biennial. His work is part of many prestigious private and public collections all over the United States, including the Boston Museum of Fine Arts, the San Francisco Museum of Modern Art, as well as the New York City Metropolitan Museum of Art, the Museum of Modern Art, and the Whitney Museum. James Siena was elected and became a member of the American Academy of Arts and Letters in 2000. His numerous distinctions include the 2009-2010 Eissner Artist of the Year Award, Cornell University (where he received his BFA in 1979). In 2004, he completed the artist residency at Yaddo and was subsequently elected to their Board of Members, in short delay. For ten years, James Siena has taught and given conferences in artistic institutions. Since 2004, he has been represented by Pace Gallery.